We would like to take this opportunity to invite you to thoroughly examine the quality and commitment that Majestic Spring, Inc. has to offer. 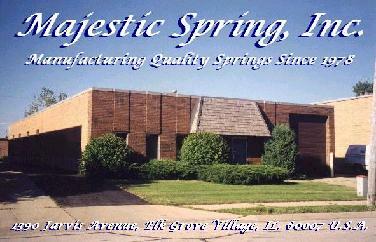 Majestic Spring, Inc. has received many awards for 100% On-Time Delivery, Zero Defects, and Total Quality Customer Satisfaction! Our quality system is based on ISO 9000 and QS 9000, and striving towards AS 9000. We produce springs, rings, and wireforms from such exotic materials such as Hastelloy, Monel, Inconel, and Titanium, as well as from more common materials such as stainless steel (302/304/316/17-7 ph), assorted carbon steel (music wire, hard drawn, oil tempered, cs/cv, rocket/missile wire), and non-ferrous, copper alloy material (beryllium copper, phosphor bronze). We have established managed inventory programs of raw materials and finished goods, to meet our customers' strict demands. Our design, engineering, analysis and testing, prototype and DFMEA services are all parts of our commitment to continuous process improvements. We are proactive, not reactive to our customers' needs and expectations. We welcome the opportunity to quote your spring, ring, and wireform requirements.